Welcome to Fat Jimmy’s Resort, this relaxed, family-run hotel is a 3-minute walk from the Beach. Low-key rooms offer bamboo furnishings, island-inspired wall art and air-conditioning. bunk beds. Upgraded rooms feature cable TV and minifridges. Family rooms sleep up to 6 guests. Kids 10 and under stay at no extra charge. Breakfast is available for a fee in an open-air restaurant/bar with ceiling fans and lush landscaping. D’Mall at the center close to restaurants,supermarket and others. It is a family oriented house that caters to all. Hope you enjoy your stay in our humble home. Guests can access our main lobby reception area and garden. Soon to be open is our lush roof deck with lounge chairs and movies at night. Our place is a small home inside the busy D’Mall near the market place. 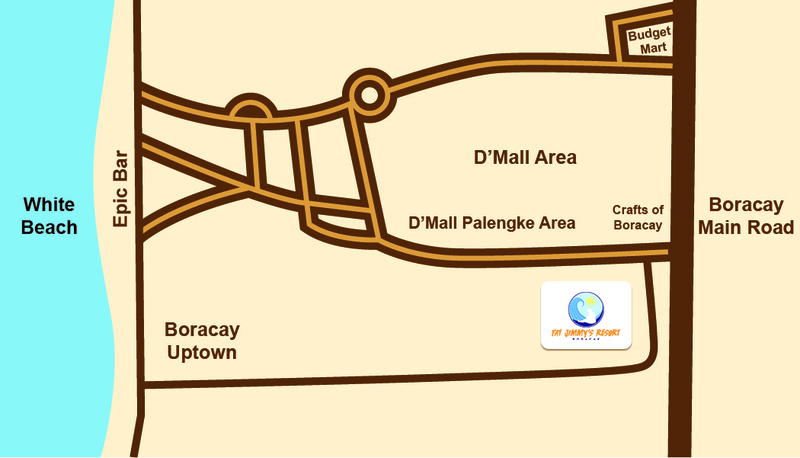 You will notice we’re near the beach around 3 min walk and just a few steps away from the main road. We are accessible to transportation and supermarkets. For questions / inquiries, please feel free to send us an email. Thank you. 1,400/head land sea transfers including terminal fees and environmental fees. From Airport to Jetty Port then ride a speedboat to the island approx (20mins) then take a van straight to the hotel. 1,600/head land sea transfers including terminal fees and environmental fees. From Kalibo to Caticlan around 2 hour bus ride. Then transfers to Boracay Island Approx 20mins.